sceval provides different evaluation methods to identify and to flag real and fake origins or to identify origins that have particular properties. Flagging is achieved by changing the origin status. Comments are set to document properties and the method. Origins from real and fake events are flagged as confirmed and rejected, respectively. Origins that cannot be flagged by one of the evaluation methods are kept unflagged. The evaluation methods declare confirmation or rejection of an origin. If neither method allows confirmation or rejection, the origin status remains unchanged. The evaluation is finished when one method explicitely declares the status of an origin. By default manually processed origins are excluded from evaluation. Manually processed origins can be explicitly evaluated by setting the origin.manual parameter. For evaluation of origins by their arrivals only arrivals with weight > 0 are considered. sceval also provides the plugin evsceval for scevent for evaluating origin comments and status. During real-time application sceval accounts for relevant data conditions. sceval only considers arrivals of stations with a configurable latency and delay configured in qc.parameters and streams accepted by the module configured in setupName and included by streamMask. setupName is used to define the module which delivers the picks. In this way sceval can be used in different pipelines with different station setup. The quality control paramters qc.parameters and streamMask determine if stations are included in the Station - Distance statistic. scqc must be running. An origin is rejected if the number of used phases (arrivals) is less than minPhase. Unused phases, i.e. phases with zero weight, are not counted. minPhase may be over-ruled by distanceProfilesMinPhase. Setting minPhase allows locator tools such as scautoloc or scanloc to publish origins with only few arrivals. Those origins can be later safely rejected by sceval but are kept in the database for manual evaluation. An origin is rejected if the depth of the origin is less than minDepth. An origin is rejected if the depth of the origin is larger than maxDepth. Seismic networks sometimes detect teleseismic phases from large events. The location from such detections may result in very deep events. The same is true for networks monitoring mines or blasts. Those origins can be later safely rejected by sceval but are kept in the database for manual evaluation. Declares: property - sets the comment maxGap. Origins receive the comment "maxGap" if the maximum azimuthal gap exceeds maxGap. The comment is evaluated by scevent if the plugin evsceval loaded. The maximum azimuthal gap is the largest azimuthal distance between two neighboring stations with respect to the origin. The stations are sorted by their azimuth (Figure: Gap criterion). Origins are confirmed if the number of used observed phases (arrivals) : gapMinPhase AND the maximum azimuthal gap : maxGap. Setting gapMinPhase = 0 disables the extended gap criterion. Unused phases, i.e. phases with zero weight, are not counted. Origins meeting the gap criterion may be later rejected, e.g. by the Station - Distance evaluation. Rejection may even happen for real events when the epicentral distances to the closest stations are large, e.g. for remote earthquakes at mid-ocean ridges. Origins of those events may be explicitely confirmed by the extended gap criterion. The station - distance evaluation is only performed if distanceProfiles contains at least one valid profile and if the origin has a higher number of arrivals with non-zero weight than distanceProfilesMinPhase. sceval currently only evaluates stations that have P-wave arrivals. 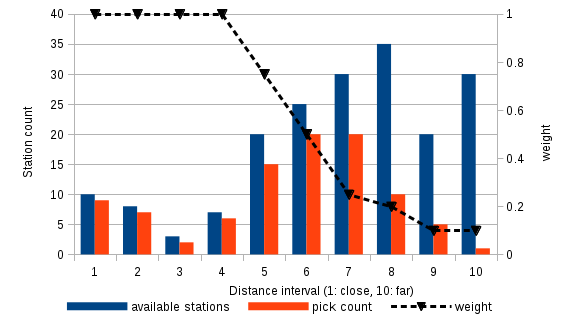 The number of available stations within customizable distance intervals are compared with the number of stations that have picked arrivals of P waves associated to the tested origin. The distance intervals and the weights for the intervals are given by distanceProfile.$name. For real origins, thus real seismic events, the number of arrivals typically decreases with distance as compoared to the number of available stations (Figure: real event). Example of an origin for a real seismic event with number of available stations, picks (arrivals) and the distance-dependent weights (distanceProfile.$name.weights). For fake origins, distant stations may have a proportionally higher number of arrivals as compared to close stations (Figure: fake event). Example of a fake origin with number of available stations, picks (arrivals) and the distance-dependent weights (distanceProfile.$name.weights). Based on the distance profile a mismatchScore is computed and compared against limits in order to origins confirm as real seismic events or to reject origins. For a mismatchScore lower or equal to mismatchScore.confirmed, the origin is flaged confirmed. For a mismatchScore lower or equal to mismatchScore.rejected, the origin is flaged rejected. It is expected that closer stations have a higher chance to detect real earthquakes thus have a higher chance to have arrivals. 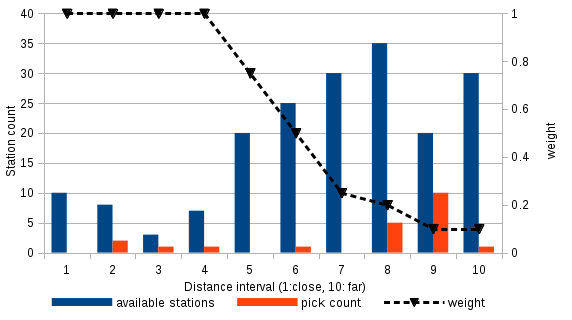 The mismatchScore is therefore calculated as a distance-dependent weighted mismatchScore comparing the number of available stations with the number of stations that have arrivals in a weighted scheme. within a defined distance interval. Distance-dependent weight profiles for distances less than distanceProfile.$name.max can be defined and included by the profile name given using distanceProfiles. The usage of the distance-dependent weight profile is controlled by the largest epicentral distance of stations with P phase picks for a considered event. The profile among all profiles is used that has the smallest distanceProfile.$name.max that is larger than the largest epicentral distance. If the largest epicentral distance is larger than the largest distanceProfile.$name.max from all available profiles, then the default profile is used as non-configurable fallback. The weights (distanceProfile.$name.weights) are configured for equally-spaced distance intervals. The distance intervals are dynamically bound between 0 degree and the maximum epicentral distance for a considered event. The number of distance intervals is given by the number of weights (distanceProfile.$name.weights). Typically, 10 intervals are used. Higher weight should be given to lower distances. The different algorithms write comment fields into the origin to identify the processing. When the origin status is changed by an algorithm, a comment indicating the algorithm is added to the origin parameters. maxGap - comment indicating that the station GAP exceeds the configured maxGap. evsceval is a plugin provided by sceval for scevent. Comments check: The comments found for the preferred origin of an event. Such comment can be set, e.g. by sceval by evaluating maxGap. Percentage check: The percentage of rejected origins of an event if the event has no manual origins. If the percentage exceeds a sceval.rejected the event certainty is set to suspected. Multiple-agency check: checking for multiple agencyIDs of all origins contained in the event. 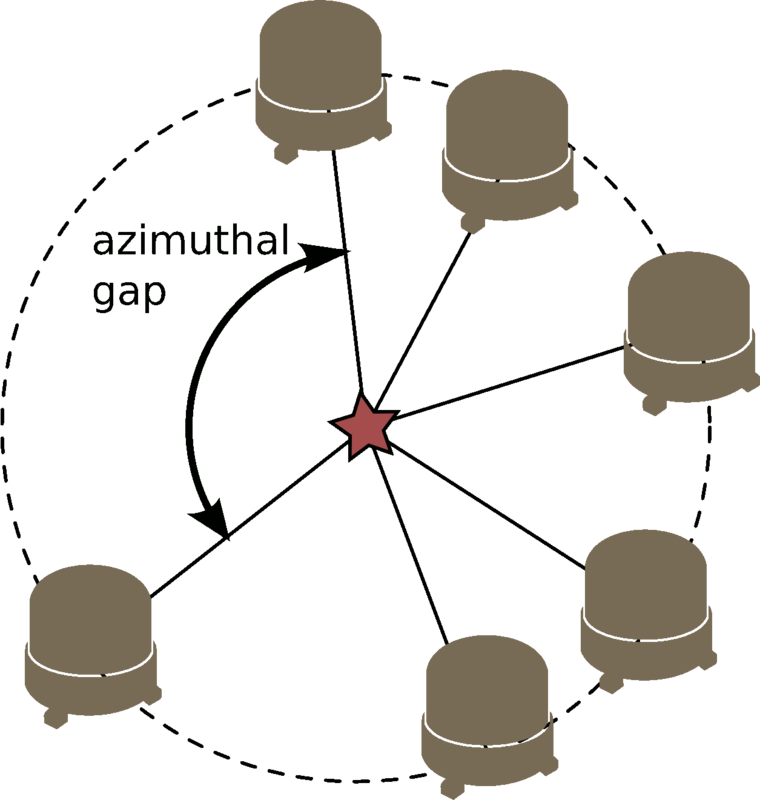 The plugin searches the agencyID of all origins related to an event with the agencies defined in sceval.multipleAgency.targetAgency. If the event contains origins with different agencyIDs, an agencyID with one of the defined names is found and the origin is neither manual nor the status is rejected, confirmed or final, the origin status is set to the value configured in sceval.multipleAgency.originStatus. The changed origin status can be used as an additional criterion for further processing such as publication on websites. Besides evsceval scevent can load other plugins such as evrc that comes with scevent. If other plugins also set the event type, then the event type is overwritten in the order of which the plugins are configured and loaded by scevent. The evsceval plugin is configured in the module configuration of scevent. Load the evsceval plugin by adding to the global configuration or to the global configuration of scevent. Configure sceval.maxGap defining the event type set if the preferred origin of an event has a maxGap comment. sceval sets the maxGap comment if the GAP criterion is met. Currently supported value are: "not existing", "not locatable","outside of network interest","earthquake", "induced earthquake","quarry blast","explosion","chemical explosion", "nuclear explosion","landslide","rockslide","snow avalanche","debris avalanche", "mine collapse","building collapse","volcanic eruption","meteor impact","plane crash", "sonic boom","duplicate","other". Configure sceval.rejected to set the event certainty. Configure the parameters related to the multiple-agency check. scevent fails to set the event tpye if the evsceval plugin is loaded but sceval.maxGap is not defined. sceval provides the auxiliary tool sceval-tune as a wrapper to run sceval in tuning mode. The tuning mode assists in providing the configuration parameters for a particular profile of the distanceProfiles in the Station - Distance evaluation. 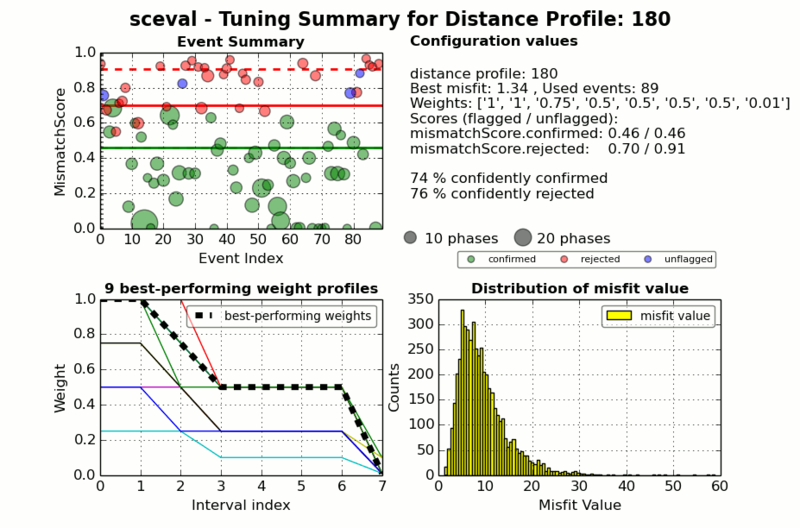 In tuning mode sceval considers manually evaluated events/origins to find the best-performing weight profile and threshold values for automatic confirmation or rejection of origins by sceval. The profile and threshold values can be used to configure sceval. The extended GAP evaluation is not considered. QC parameters are not considered. Manually review and evaluate the origin status for many events. Choose "confirmed", "rejected" or leave the Origin status unflagged. Use scolv to manually evaluate the preferred origins of events by setting the origin status. During evaluation set the origin status to confirmed, rejected or unset (if flagging is not reasonable). For tuning of sceval do not add new picks on stations that were not picked and associated by the automatic system. Otherwise the origins with arrivals will not be representative of the automatic system. The considered time window should be long enough to contain a significant number of each rejected and confirmed origins, e.g. 50 rejected and 50 confirmed origins. Create an event XML file from the events that are manually reviewed. Generate the event XML file, e.g. eventlist.xml, from the evaluated events. Choose any file name. The file name is provided through parameters. Use scxmldump to dump the events into a XML file. Choose any file name. The file name is provided to sceval through parameters. Create a configuration XML file containing the system configuration. Use scxmldump to dump the system configuration into a XML file. Choose any file name. The file name is provided to sceval through parameters. Use scxmldump to dump the staton inventory into a XML file. Choose any file name. The file name is provided to sceval through parameters. Example code for generating the XML files in the previous steps. Generate the list of weight profiles. Use sceval-tune to create a list of profiles considered for finding the best-performing weigth profiles. Choose a sufficient number of distance intervals, e.g. 5 - 10 intervals and a list of weight values. sceval-tune will find all meaningful permutations of weights for all distance intervals. Default value may be used. Save the profile listlist in a file. Review and adjust the profile list if desired. arg: name of the file containing the created profile list. See the help sceval-tune -h for the relevant parameters to create the profile list. Tune the configuration parameters for a particular profile of the distanceProfiles. Run sceval-tune in a command terminal to find the optimal configuration parameters for one of the distance profiles given in distanceProfiles. Repeat the tuning for all profiles individually. The tuning is relies on a sufficient number of manually confirmed and rejected events. For tuning provide the considered weight profiles in the profile list file. These weight profiles are evaluated identifying the best-performing weight profile and the associated threshold values mismatchScore.confirmed and mismatchScore.rejected. The best-performing weight profile and the threshold values are determined by optimizing the automatic wrt. the manual evaluation. As a measure, the mistfit is minimized. The configuration parameters and quality parameters are output to the command line. Based on the suggested configuraton parameters, the percentages indicate the number of events that would be confirmed or rejected by the automatic system wrt. the manual evaluation. The main plot figure is generated to review the performance of the tuning and the configuration parameters. 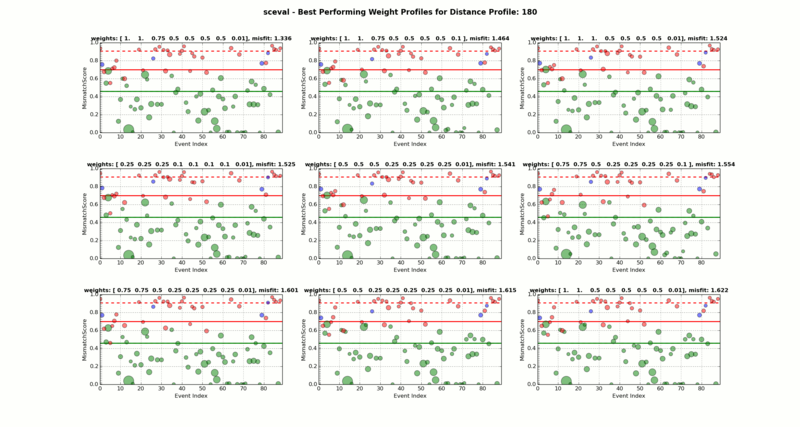 The optional additional plot figure shows the results for the 9 best-performing weight profiles. Two possible values for mismatchScore.rejected are provided based on the confirmed or on the unflagged origins. Both values should be similar but the value for the confirmed origins should typically be chosen. If mismatchScore.confirmed and mismatchScore.rejected are largely separated, many origins may remain unflagged by sceval. Increasing mismatchScore.confirmed or decreasing mismatchScore.rejected will reduce the number of unflagged origins but will possibly result in wrong automatic flagging of real and fake events. arg: name of the distance profile that is to be tuned. The profile must be configured. The name must be contained in the configuration parameter distanceProfile. arg: name of the file containing the profile list. arg: name of the configuration XML file. arg: name of the inventory XML file. arg: time window of the considered events. arg is the minimum number of phase arrivals in origin to consider the event. Equivalent to minPhase. Show results from the 9 best-matching weight profiles. In sceval configure the tuned distance profile using the proposed configuration parameters. sceval-tune provides the configuration parameters and the tuning statistics on the command terminal where it was executed. In addition, one main and one additional (--addplots) figure are created for visual inspection of the tuning results. Main figure showing results for the best-performing weight profile. Solid line: mismatchScore values based on flagged events. Dashed line: mismatchScore values based on flagged and unflagged events. Additional figure showing results for the 9 best-performing weight profiles. Generated when using --addplots. Solid line: mismatchScore values based on flagged events. Dashed line: mismatchScore values based on flagged and unflagged events. D. Roessler, B. Weber, E. Ellguth, J. Spazier the team of gempa: EVALUATION OF EARTHQUAKE DETECTION PERFORMANCE IN TERMS OF QUALITY AND SPEED IN SEISCOMP3 USING NEW MODULES QCEVAL, NPEVAL AND SCEVAL , 2017, New Orleans, USA, AGU Fall Meeting, abstract S13B-0648. Minimum number of phase arrivals (P or S) used for locating. Origins with fewer arrivals are rejected. Only consider arrivals with weight > 0. Default is 0.
minimum depth criterion: origins with depth less than minDepth are rejected. Default is -10.0.
maximum depth criterion: origins with depth > maxDepth are rejected. Default is 745.0. Gap criterion: maximum allowed azimuthal gap between adjacent stations providing arrivals to one origin. Origins with a larger gap are rejected. Only consider arrivals with weight > 0. Default is 360.0. Extended gap criterion: Origins with gap lower than maxGap and more than gapMinPhases arrivals are confirmed. gapMinPhase = 0: ignore check. Default is 0. Registration of distance profiles for station - distance evaluation. An empty list disables the station - distance evaluation. Minimum number of P-phase arrivals for applying the station - distance evaluation. Only consider arrivals with weight > 0. Default is 0. Defines QC parameters to observe. Each parameter is associated with a value range. If any of the defined ranges is exceeded the corresponding station is disabled. Use '-Inf' resp. 'Inf' if no upper or lower bound should exist. Works with scqc only. Config setup name used for the initial setup of the active station list. By default the name is global. Default is scautopick. Use to filter incoming origins by author. If omitted no filtering is applied. Enable/disable evaluation of origins whose evaluation mode is set to MANUAL. Default is disable. Check the box to enable the evaluation. Default is false. Mismatch between active stations and used stations. If the score is less than or equal to the evaluation status is set to CONFIRMED. Default is 0.5. Mismatch between active stations and used stations. If the score is greater than or equal to the evaluation status is set to REJECTED. Default is 0.7. distanceProfile.$name. * $name is a placeholder for the name to be used and needs to be added to distancesProfiles to become active.